EngagingPatients.org Cost of Care: Engaging in Difficult Conversations - Welcome to EngagingPatients.org! Initially unable to tolerate more than just a few minutes of screens and lights, my son had to be kept home from school and was on a concussion protocol–unable to play sports, watch TV, use his phone, or play on the X-box. This is pretty much like being in jail for any budding adolescent. It was a trying time in our household as my son experienced severe headaches, balance issues, and problems with his vision. Over two months later, he is significantly better but still going for physical therapy and has not yet been cleared for sports. And this was a mild concussion! There is a detail in this story that I purposefully included in the first sentence…the date of when this event occurred. We were most concerned about the health impact of the concussion on our son, but realized we had another stressor to contend with once the bills began rolling in. The reason the date is so important is that we receive our health insurance coverage through a high-deductible health plan (HDHP). The way this plan works is that we pay full price for most services out-of-pocket until our annual family deductible of $3,000 is paid off. With three children who have well-visits and minor colds and illnesses requiring doctors’ visits throughout the year, this isn’t usually an issue. We may have to pay a couple hundred dollars out-of-pocket every few months to pay for our family’s typical care. 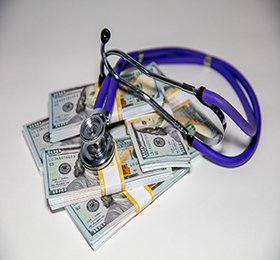 However, if we have an emergent or unexpected health issue prior to paying off the deductible, we have to pay whatever the amount owed is up to $3,000. Since the concussion occurred at the beginning of the year, we had not yet had many routine healthcare costs and, are on the hook for paying the bills associated with the concussion all at once, up to $3,000. Although many have debated the value of HDHPs, that isn’t the purpose of this discussion. Instead, my son’s concussion reminded me about the ways in which the costs of care impact all of us. A few things occurred to me in the midst of receiving a flurry of bills from various providers. First, until this experience, I had not taken responsibility for better understanding the mechanisms of my HDHP. Although I knew in concept it was possible we would have to pay out-of-pocket up to the deductible amount if an emergency occurred, I hadn’t thought about the impact on my family’s finances. I also had not done due diligence to understand how much all of the care we were receiving would cost. I was most concerned about ensuring my son received the best care possible, but never considered how much the concussion specialist or physical therapist would cost. This is not to say I wouldn’t have sought this care if I knew the cost, but perhaps I would have been more prepared to evaluate the impact on our finances. Second, I was impressed that the concussion specialist’s office had a prominent sign explaining their billing practices. The sign indicated that we would receive a bill from the physician, but that we might also receive a bill from the hospital (where the physician’s office is located). I wish I had looked more carefully to evaluate the reading level of the sign – would someone with a middle school education be able to understand the sign? Third, and perhaps most important, I never had a discussion with any of the providers (ER, pediatrician, concussion specialist, physical therapy) about the cost of my son’s care. Admittedly, I didn’t bring it up, nor did I really care when my son was initially injured. I only cared that he got better. So who is responsible for bringing up the cost of care and when is it most appropriate? This is clearly a complex and loaded issue. From a patient or family member perspective, I guess that at least some people, like me, may not care about costs during an emergency situation. Other reasons why people don’t bring up cost include embarrassment, fear of not receiving the best treatment and discomfort with discussing money with healthcare professionals. On the other hand, there are a host of reasons why healthcare professionals may not want to talk about the cost of care, some of which are similar to the reasons why patients don’t bring up the topic, either. Discomfort with discussing the cost of care and not wanting to embarrass their patients top this list. Additionally, they may feel there is an ethical dilemma in bringing up costs in the face of treatment discussions. All possibilities should be discussed regardless of ability to pay. They may not want to single out a patient or assume that a given patient can or cannot pay for care. Healthcare professionals are trained to impart knowledge based on data and evidence. However, how much a particular service or treatment will cost is not usually readily available to them. So, how do we get over our mutual fears of having the conversation and making it routine when care is provided? I think there are a few ways to start – beginning with me. As a patient and family member, I need to better understand the mechanisms of my health plan and how it impacts my family’s finances. I also need to be more prepared to ask questions, including about costs of medications and ancillary services, such as physical therapy. My healthcare professionals can help me be more empowered by providing good and health-literate information about billing practices, how much services may cost (if available), and who I should contact if I have questions. Additionally, providing information about how to read invoices or, in the insurer’s case, my statement of benefits, would be helpful. My graduate degree unfortunately does not facilitate understanding of these documents! For health professionals, screening for cost sensitivity in non-emergent situations should be routine for every patient, every time. This can be as simple as asking patients during history-taking if they have concerns about paying for treatment or other barriers that may result in financial sensitivity (such as concerns about missing work). If the professional is concerned that this may impede the patient/clinician relationship, a medical assistant, patient navigator, or front-desk employee can ask the question. Additionally, starting the conversation about the cost of care could be a huge relief to patients who are afraid to bring it up. Always being open and receptive to these conversations by using appropriate body language (direct eye contact and not multitasking) is important as well. In my case, there was much more my health professionals and I could have done to address costs associated with my son’s care. Fortunately, his health continues to improve. It will, however, take some time before my pocketbook fully recovers.